Shatranj is the Persian chess variant dating from around the seventh century AD. It is a direct ancestor of modern Western Chess, differing only in a handful of ways. Makruk is from the eastward branch of chess that extended into South East Asia. Shatranj is part of the westward branch that swept through the Middle East, North Africa and on into Europe. This game is the evolutionary step between Chaturanga and our game. 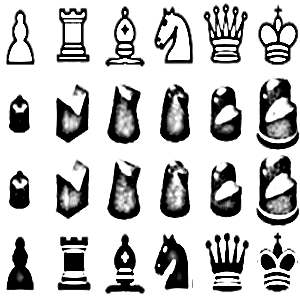 The pieces are the same as Western Chess although some of the movements are different. There were also a number of other changed to form the rules of Western Chess. It's a slower game as the pieces are not quite as powerful. There is also a substantial history of literature on the game dating back to it's heyday. Many books have been written on strategy and there is a wealth of Shantraj problems composed by masters of that age. You can now upload myths and legends this variant. There was a huge volume of analysis on Shatranj opening systems produced in this period. Manuscripts containing chess problems have also been recovered. The material within contain references to other works that have not yet been found. There were five classes of players to measure strength. Aliyat (grandees) who were the elite masters. Mutaqaribat (proximes) who could win 2-4 games out of 10 against grandee with odds of a pawn. Third class - players who received odds of a fers (counselor) from grandee. Fourth class - received odds of a knight. Fifth class - received odds of a rook. The most famous aliyat players from this era were Abun-Naam, Rabrab, Jabir al-Kufi, Al-Adli, Ar-Razi, As-Suli and Al-Lajlaj. Among these Rabrab, Ar-Razi and As-Suli were thought to be the strongest. Shatranj is played on an 8x8 uncheckered game board. The pieces set up the same as Western Chess. The kings face each other as they do in our game. They can be placed on the d or e file, it doesn't matter. As long as they start on the same central file. The pawns move as ours do except they cannot move two squares initially. There is no en passant capture in Shatranj. Pawns promote only to fers. Their rook (ruhk) move the same as ours as does their knight (called a horse or faras). This game has a piece called 'Alfil' instead of a bishop. It moves two diagonal squares in any direction, never one. It has the ability to leap like a knight. They have a fers (counselor) instead of a queen which can move one square diagonally in any direction. They did not have castling. Stalemate was a win for the player delivering it. You could also win by baring your opponent's king (capturing all of his other pieces). If he could bare your king on the very next move he would claim a draw. Shatranj is similar to our chess in many ways. The pieces usually having identical or similar movements. They are in some cases weaker than our pieces which means it takes longer for the two sides to engage. Players would typically play for a specific opening position early on without engaging their opponent's pieces. They would completely ignore each others moves as there would be no attack before the pre-ordained moves had been played. These opening positions were called tabbiyya meaning battle array. From that point the two sides would enter into combat. Shantraj problems called mansubat (singular: mansuba) provide good training for tactics and strategy. The endgame problems that contain rooks and knights are relevant to Western Chess today. Incredible to think they were composed over 1,000 years ago. Shatranj doesn't seem to be widely available to play online. You can play a computerized opponent on Pathguy. Do You Have a Shatranj Tale from the Persian Gulf? Experience playing Western Chess should stand you in good stead playing Shatranj. The more pieces that leave the board, the more similar to our chess it becomes. It gave rise to several variants of which Western Chess is only one. Usually the sign of a good game. Robert J Fischer developed a very interesting variant called Chess960. Also called Fischer Random Chess, it is similar to Shuffle Chess.